The Swing Orange Cross combines in a unique way everything pilots require from a modern paraglider reserve. It is a cross canopy which incorporates the best features of various types of reserve design. 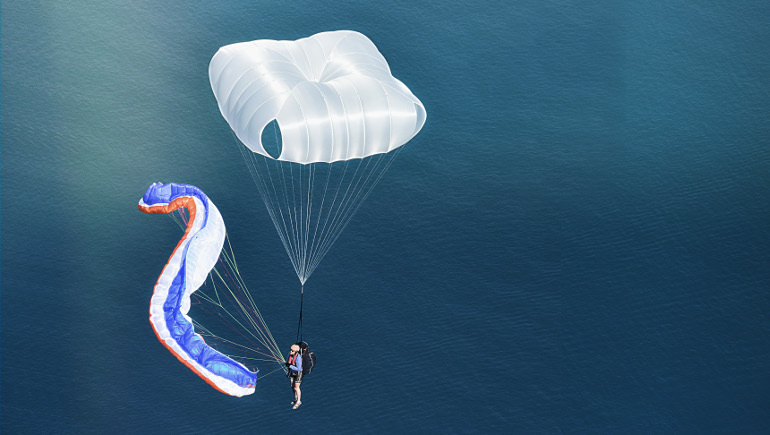 The cross canopy design is pulled down low and, by special openings for dynamic pressure distribution, it achieves a level of pendulum stability not seen before, even in strong or unfavourable wind conditions. The innovative concept gives excellent opening times, but at the same time prevents any unwelcome tendency with cross canopies to glide upwards. This helps avoid unnecessary stress on the pilot in an extreme situation and the low sink rates allow plenty of time to focus on the landing. In addition to the features essential for survival such as pendulum stability, rapid opening and good sink rates, you will be impressed by the extremely low weight and small pack size of the SWING Orange Cross, which was achieved by using the latest materials. We were able to simplify the packing method considerably, making it very similar to that used for a round canopy. Manufactured in Europe, the excellent workmanship with top quality products ensures a long life of up to 12 years. The SWING Orange Cross is the right choice for pilots wanting to minimise the potential risk of injury if they have to land using a reserve. The small pack size and low weight of the Orange Cross make it suitable for use in convertible and/or lightweight harnesses as well. Whether you regularly fly cross-country or fly infrequently, whether you are a social pilot or an acro pilot – with the SWING Orange Cross, you can be completely confident that your safety is in hand.